I thought you were the peanut butter type? Oh, I am. Trust me. These pistachios were actually an impulse buy. I passed a giant bag at the grocery store and grabbed it (I think it was the packaging... it was just so pretty!). Little did I know in my moment of weakness, I had accidentally grabbed a bag of roasted pistachios. While the roasting process adds a deeper, stronger flavor to nuts, it also destroys some of the nutrients... that's why I stick to raw nuts and nut butters. Nonetheless, the minerals and healthy fats are still present! So even though I was never really a fan of pistachios, I knew that they always added beautiful colors and presentation to a dish. Even though this is green, it's gorgeous. Not to mention, incredibly delicious and amazingly addicting! 2. Scoop into a mason jar (or any other cute jar) and store covered in the fridge. 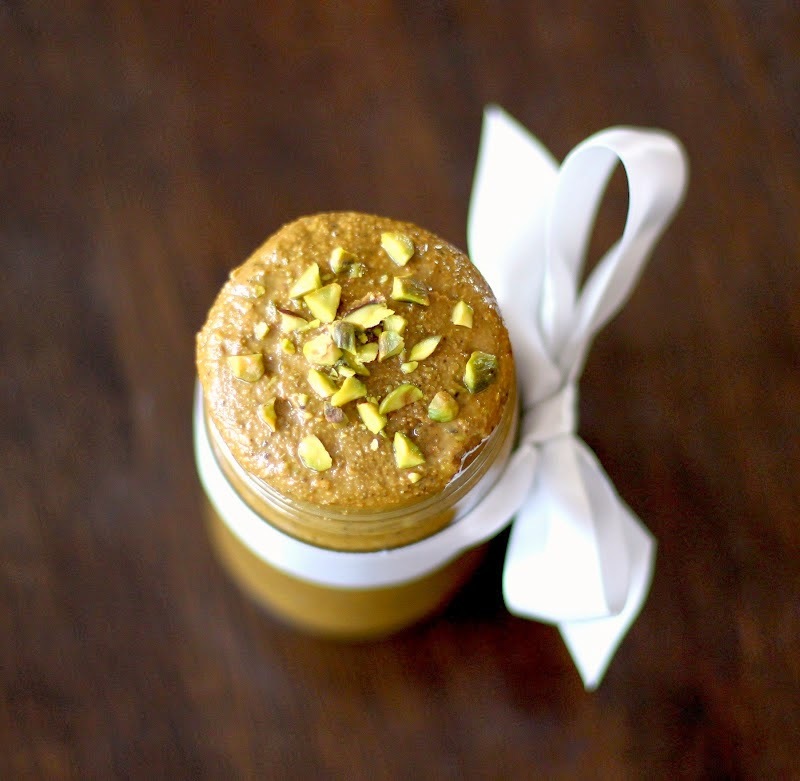 Now where can you use this pistachio butter? Spread it on my Pistachio Cake Bars! Pistachio Butter & Jelly Uncrustables--did someone say scare the kids?? Finally, Lemon Pistachio Krispy Treats with Honey-Vanilla Fondant & Strawberry Jam! Delicious! 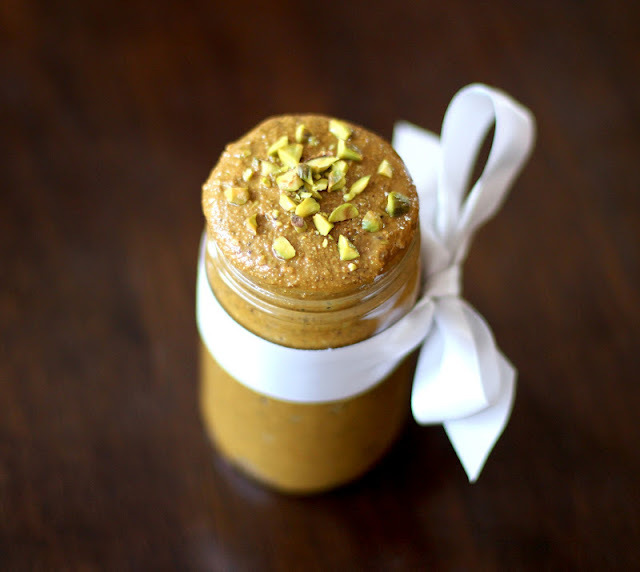 Pistachios are my favorite nut, but somehow it never even crossed my mind to make a nut butter out of them! I can't wait to try this out. Yum! I can think of at least five people who would go nuts (har har) for this. I can't wait to try it. Thank you! Delicious! Just a little interesting piece of info I learned a few months back...all nuts sold in normal grocery stores are technically "cooked" (even if stated as "raw") if they are shelled. Almonds (and possibly others) are illegal to sell unpasteurized, so 99% of almonds are cooked. Truly uncooked nuts are sold usually in health food stores or the health food section of some grocery stores by the raw vegan stuff and specially marked as unpasteurized raw nuts. Oh wow, I didn't know that! Thanks for the info! And thanks :) by saying that YOU are the inspiring one! I love this! Pistachios are my favourite nut and I've been waiting years for someone to sell a pistachio butter and this made me realize that I should just make it myself. Thanks! Looks so good! 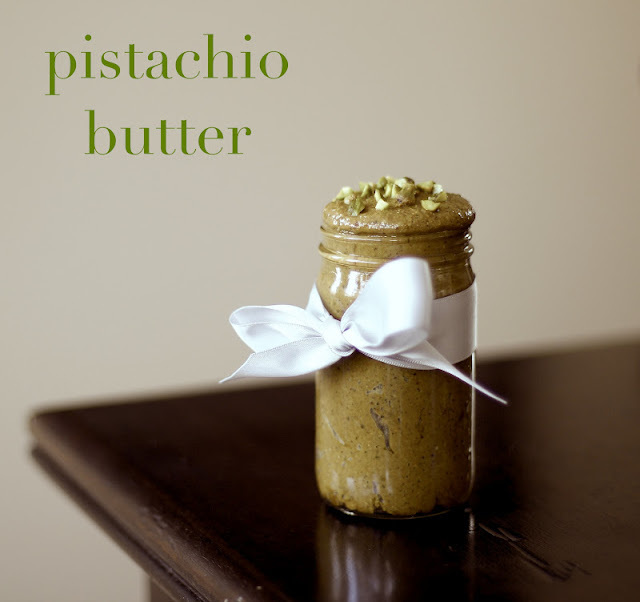 I love homemade nut butters but have never made it with pistachios...I'll be trying that for sure! Your photos are gorgeous btw!